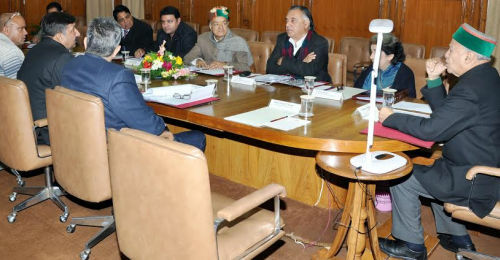 Himachal Pradesh Cabinet Meeting granted approval to ‘The Himachal Pradesh e-Stamping Rules, 2011’ for implementation in the State to collect stamp duty electronically in addition to pre-printed stamp papers for greater convenience and accountability. Authorized Collection Centres will be set up for collection of stamp duty. The new system will benefit the customers by fast deposit of money getting their documents registered under one roof and avoiding repeated visits to Treasury and Bank or Stamp Vendors. It will help in checking the pilferages. Cabinet approved the mechanism for running of ‘Himachal Seva Sadan’ being constructed at a cost of Rs. 10.50 crore, in Sector 25, Chandigarh, consisting of 23 double bed suites, attached toilets and kitchenette, 15 six bedded and 3 number 3 bedded dormitories (total 99 beds) besides one transit room of 6 bed capacity, completely air-conditioned, to facilitate the patients and their attendants visiting Chandigarh for treatment in PGI etc. with quality boarding and lodging facilities at reasonable costs. It granted sanction to create 8 posts of Assistant Engineer (Civil) in Irrigation and Public Health Department on regular basis. Adequate number of posts were approved to make Himachal Pradesh Private Education Institutions Regularity Commission functional. Cabinet also granted approval for creation of 23 numbr of posts of teaching and non-teaching categories for Government Polytechnic, Talwar, in Jaisinghpur Sub-Division of district Kangra. Cabinet granted approval for renewal of Smart Cards under National Health Insurance Scheme upto February 28, 2012. Negotiation Committee was approved for expeditious acquisition of private land for Indo-Tibetan Border Police to raise a battalion of National Disaster Reserve Force in Mohal Uprid, Mauja Kopra, Tehsil Nurpur, District Kangra was also approved. It was also decided thatsimilar Negotiation Committees will be constituted for all Departments to deal with similar cases. The Cabinet also approved rationalization of Entry Tax, whereunder all Industrial inputs will now be taxed at a uniform rate of 1 percent.